To say Southeast Asia has been on the radar in the last few years is an understatement. The lure of Thailand’s turquoise waters following Leonardo di Caprio’s turn in The Beach (it is not a good film), architectural and religious treasures like Angkor Wat in Cambodia and the rich and war-torn history of Vietnam combine to make the region the Sahara Desert (read: hotbed). Let me list the images that you may conjure up on the mention of Vietnam: A soldier sweating and bloodied; cities so bustling that finding the space for a star jump may be difficult; locals seated beside their stalls with a bowl of steaming hot pho at the crack of dawn; a wooden boat wading down brownish waters lined with markets floating defiantly day in and day out. Let me now list the images that I conjure up on the mention of Vietnam, having had five months to reflect: A soldier sweating and bloodied; cities so bustling that finding the space for a star jump may be difficult; locals seated beside their stalls with a bowl of steaming hot pho at the crack of dawn; a wooden boat wading down brownish waters lined with markets floating defiantly day in and day out. You see, Vietnam does not hide its identity. That rich and war-torn history, which seems better forgotten, actually forms an integral part of the personalities of these proud people. That steaming hot bowl is symptomatic of the locals’ routine. The floating markets, the population density; all of it makes Vietnam what it is, and the Vietnamese people know it. That’s why we go. I failed to mention the new images I see. Crystal clear waters, with shimmers of white where the sun directs its strong gaze. Mopeds doing circles round unfazed pedestrians in the middle of the road. Suits and dresses fitted to the exact contours of the human body by experts of the trade. Places of religion, of life, of daily sustenance surrounded by verdant green that we just don’t have in our “developed” nations. 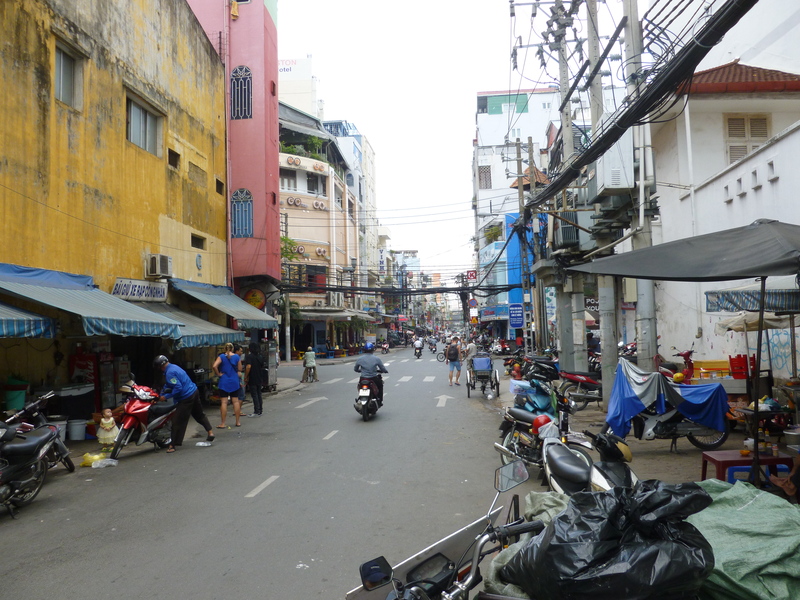 We started in Hanoi, and it was everything that I had expected, and wanted. It is a microcosm of Vietnam. The bustle and the history is there (two days a week you can see the embalmed and perfectly preserved body of the revered leader of the nation, Ho Chi Minh). So is the food and the quiet green spaces to take it all in. It is the capital after all. What hits first though is the heat and humidity. We went in the monsoon season in August (it rained 1 day out of 14) and it was between 35 and 40 degrees Celsius. I am an Indian, so by the textbook I should be fine. However, I was born and have lived in London all my life and therefore, unfortunately, I have developed a preference of room temperature over the years. Needless to say, do not be a hero and decide to walk around for 5 hours straight with intermittent air-conditioned rest stops in cafes to refuel. Taxis are cheap, but beware of naivety since they can be extortionate in relative terms once it is clear you are not a resident of the country. On a side note: the standard fare from Hanoi airport to the Old Quarter is around 350,000 dong (around £10) and probably the most expensive thing, outside of tours and train journeys, that you will spend on. Hanoi’s charm is just its being. I would not say there is any particular sight that comes to mind. 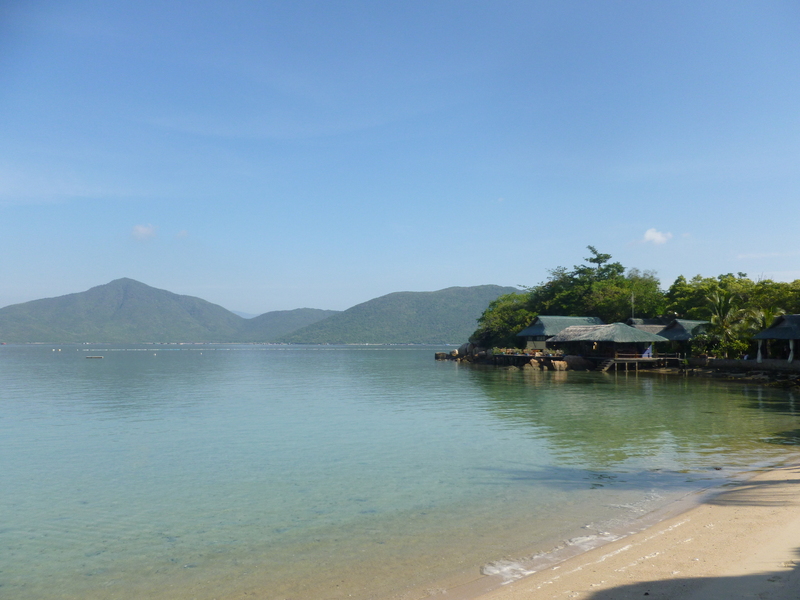 It is a place of people, of lakes and of pagodas. It is easy to become overwhelmed in the first couple of days here, a harsh whirlwind. For me, a more apt description is that it is like a hurricane; it hits you without warning causing a complete overload, and then you reach the eye. A stillness, a calmness, a tranquility can be found, completely unexpected. My favourite eye was Hoan Kiem Lake. There are many places to eat. As with any big city, if you look hard enough, you will find what you are looking for. You don’t need to worry about being priced out here, and so your choice is expansive. We ate at Bun Bo Nam Bo on the first night to taste authenticity; and authenticity is what we received. As if so sure of itself, it offers only two choices: vegetarian and non-vegetarian (but with a choice of meat). The ceilings are low enough as if to affirm the stereotypically-proportioned Vietnamese local and not the frame of a six-foot three foreigner. The vegetarian food however catered to our tastes spectacularly. A simple pho but made with the knowledge of routine and perfection. Do not shy away from the street food either. You may at first be overcome by a natural anxiety given the knowledge of the consequences of your stomach not agreeing; we’ve all been there. However I had not one problem, and it is not worth missing out on the local expertise. If it’s good enough for them then it is certainly good enough for us, given they must know what good Vietnamese food tastes like. The coffee is also a locally-produced staple and oft-praised for its sweetness in flavour (a result of the condensed milk that is used). Other highlights of Hanoi were the night market (an assault on the senses) and just walking around the Old Quarter. Our five hours of wandering got us lost but immersed us in some wonderfully quaint and often desolate and run–down streets. We found the Temple of Literature — a temple of Confucius that hosts the first national university of Vietnam. It was a beautiful place to pass a couple of hours: small but more serene than its surroundings. A visit to Hanoi is not complete without a visit to its centrepiece, the Ho Chi Minh Mausoleum, where the body of their leader lays embalmed. The streets surrounding it are wide, quiet and regal and it feels like a different place. Outside, ice cream vendors provide one solution to the nauseating heat. Inside, the air conditioned space provides another. A nominal fee is paid to enter, and the museum itself is well worth a visit with a wealth of information about the history of the country and Ho Chi Minh, the man and the myth. Then there is of course the main attraction — the body that is lovingly preserved and sent to Russia twice a year for maintenance. We wandered in expecting to just come across it. Before we knew it, we had seen every crevice that the building had to offer and had somehow ended up back outside at the exit without seeing Ho Chi Minh. I convinced myself that actually, it must therefore be in Saigon. It is of course in Hanoi, but we missed it. It is open two days a week, neither of which was that day. A simple and pivotal bit of research that we had just neglected — a job well done. 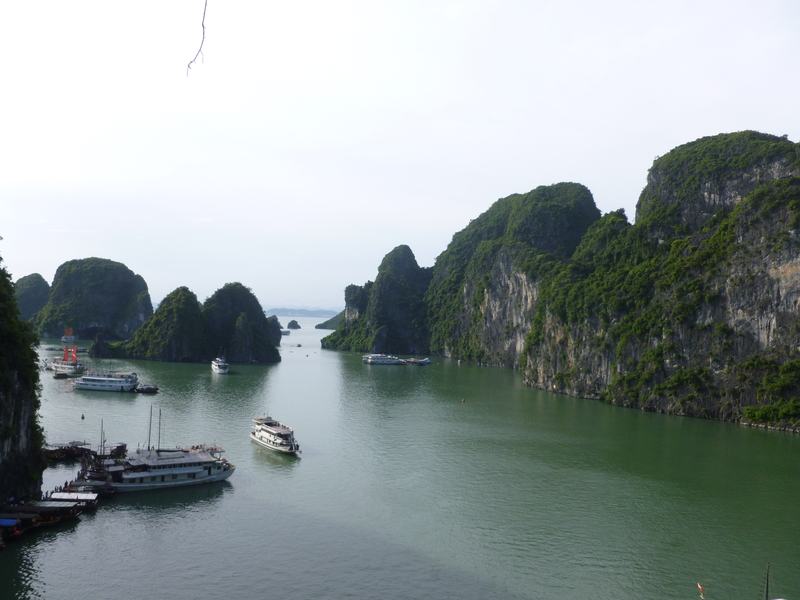 I was certain before going to Vietnam that Halong Bay would be my favourite place. The name conjures visions of emerald green formations rising from a crystalline turquoise, alluring in its vastness and romanticised by travellers for years. Needless to say I was looking forward to this a lot. I wish I hadn’t; high expectations are a dangerous thing. While we were in Hanoi we booked our obligatory one night junk boat (recommended length of stay instead of two) for Halong Bay. There are really three choices: budget, middle ground and expensive. Budget means party boat and for a one night stay will set you back 75 USD per person. The middle option is around 75-150 USD and above 150 USD will give you relative luxury. We went for the middle ground on an appropriately named boat called Red Dragon at 98 USD per person. This offered a better selection of food (and a cooking class), and the pictures looked good. The clincher was its good reviews (note that within all price ranges there are countless operators and boats; book in Hanoi and not in Hoi An, where there are tourists abound and prices reflecting this). We took the four-hour coach journey to Halong and boarded the boat. It’s pretty small but had a nice top deck with a few loungers and a carpeted area to relax in the sun. After an hour or so, you enter Halong Bay, the picture-perfect postcard. It was beautiful but I was underwhelmed. Maybe my expectations had been too high. Nonetheless over the course of the two days, we met some very like–minded people (vindication for the choice of boat), saw a very interesting cave formation and did some kayaking for 45 minutes, all of which I enjoyed. We also stopped at a ‘beach’: crowded and full of litter. It was here really where my heart sank a bit. I realised Vietnam is on the cusp of a great surge of foreign interest, the likes of which Thailand experienced a few years ago, but it is not ready. Halong Bay will be sullied unless something is done fast; it doesn’t deserve the fate I foresee. Hue was next via a sleeper train. It’s about 12 hours — we were in a cabin with a Vietnamese family of four. I drew the short straw and had top bunk. My face was so close to the ceiling it was like two boxers in a clinch. There’s not much space up in the rafters. If you happen to move around when you sleep, don’t. You will probably hear a thud and feel a throbbing pain in your head not long after. The ceiling doesn’t need boxing gloves to do that. We didn’t spend long in Hue but it was impressive. Here is where the imperial tombs lay, and there are four main ones. We chose Minh Mang, further out but more expansive and at one with the surroundings than the more frequented and architecturally-impressive Khai Dinh. It ended up being one of my favourite places. There were barely any people, it was in the middle of nowhere and it had a strikingly still ambience. I felt I was really seeing Vietnam here in the way I had envisioned. Three hours passed before that old friend food called out to me. We ate some excellent spring rolls in Hoa Binh Cafe and then sat in the local bar till evening chatting with whoever came in our way. I must say this is as much of a part of the travelling experience as anything else and I remember such times very well. 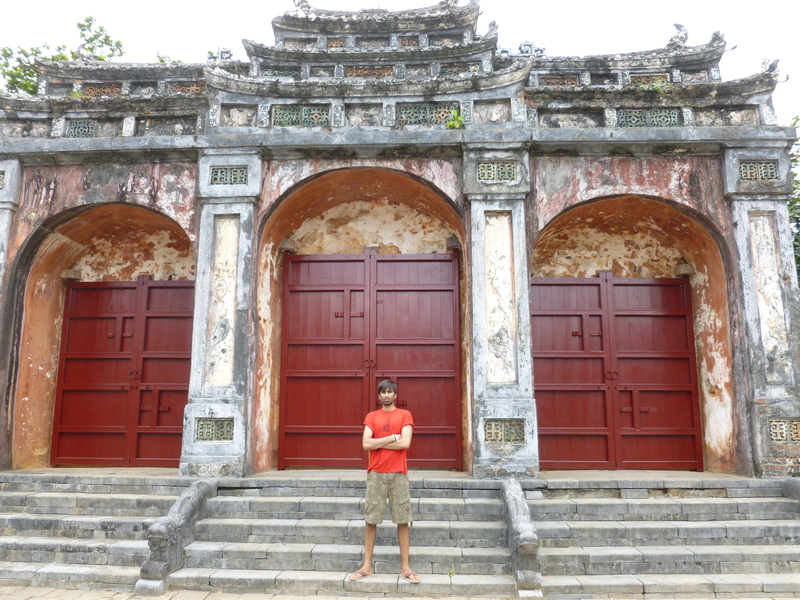 A four–hour bus journey later, we reached Hoi An. This is the picturesque intermission. Like the ice cream you get in the interval at a theatre, it is the real star of the show. It is a beautiful place to walk around, with markets surrounded by overhanging trees, a weathered wooden bridge over a flowing river (the photographer’s dream) and a coastline. There’s also the small matter of a fully tailored suit for the equivalent of £50. I used Peace Tailors because of numerous excellent reviews and the suits are still going strong. 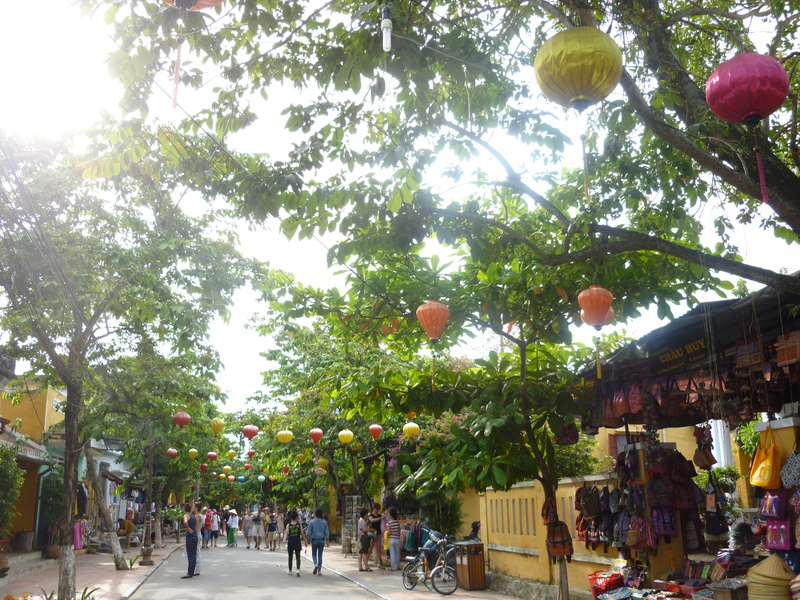 For me however, Hoi An didn’t have that special intangible quality that makes me love a place. I cannot say more, since for many other people it did, and that is simply down to personal preference. Travelling around Vietnam is tiring. It can take its toll. Three days we now spent in Whale Island to rest it off. Those shimmering, crystal clear waters I mentioned earlier, that’s over here. I am a very big advocate of environmental sustainability, and therefore this eco-lodge appealed. It is not cheap, nor would I say it is authentic Vietnam in terms of the terra firma. No, this was authentic Vietnam for the life under the water. National Geographic set up a dive centre here for a reason. You can guess at what level my expectations were. I wasn’t prepared for them to be dealt a blow again, but that’s what happened. Recent years of tourism again had destroyed delicate ecosystems. Snorkelling in the water with me were crisp packets and non-biodegradable plastic bottles. In one and a half hours of snorkelling, with the promise of turtles and even sharks if luck was on your side, I settled for an average-sized barracuda. I probably saw a total of 50 fish. That is really debilitating for once a global hotspot for diving. Back on land though, life was good. The bar overlooked the beautiful, warm water, we met a couple of people and during the day we just went straight into exploring the bush. There were paths we were meant to follow but I’m not sure where they were. We reached the other side anyway, completely deserted but for some incredibly vibrant-looking lobster heads. There are sometimes unexpected encounters with wildlife in Vietnam. There was the scorpion that joined us in the room here, and there was the snake in the grass in Hanoi. This is a novelty I will never get sick of. The final stop was the most famous. Saigon, also known as Ho Chi Minh City. Subject to so many war films, (“I love you long time”), this is maybe the place of the richest history anywhere in the world. It is also the place with the greatest museum I have ever seen. The War Remnants Museum was mesmerising, horrifying and must absolutely be visited by every person who visits this country. It is three floors depicting the horrors subjected to the Vietnamese people during the Vietnam War, and in particular Agent Orange. I am not going into further detail because you need to find out by going. Outside were tanks and planes which very heavily appealed to my XY chromosomes. Saigon is the other big city of Vietnam with Hanoi. There is often a debate between visitors about which they preferred. For me it was Hanoi. I had never seen South East Asia, and that first city will always be the one I remember as the place where I experienced this corner of the largest continent in the world for the first time. Saigon has all the same choice of food and entertainment as Hanoi, maybe more. We stayed in District One, right amongst the markets and restaurants of which we were definitely spoiled for choice. 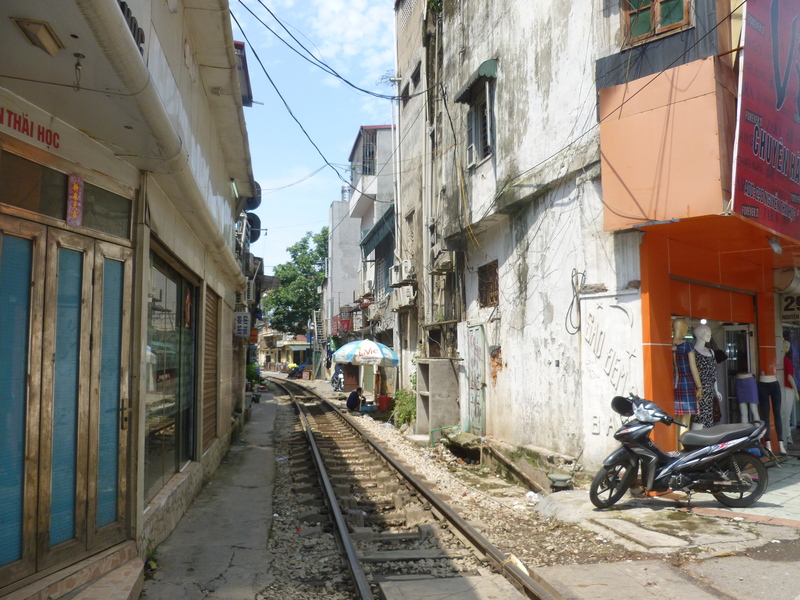 The truth is I hadn’t come to Saigon to see a place of surface beauty with numerous sights and things to do. I had come to feel the history of Vietnam, and make sure that when I boarded that plane back home it would still be with me. Believe me it was; remnants of the war made sure of that.